Your dentist may suggest root canal treatment if there is inflammation or infection inside one of your teeth. They will clean and fill inside the tooth to prevent further damage or infection. Root canal treatment can save your tooth from having to be taken out. Your dentist will discuss the procedure with you before they start. It might be a bit different from what we’ve described here because your treatment will be designed to meet your individual needs. Your teeth have ‘roots’ that anchor them into your jawbone. Inside each of your teeth there is a mixture of blood vessels and nerves called pulp. Pulp sits inside a space called the pulp chamber and this extends down into the roots of the tooth. The pulp chamber within the root is called the root canal. If your tooth is damaged, bacteria can get inside it. This causes irritation, pain and swelling. If the pulp inside the tooth becomes infected, this can spread into the pulp inside the root canal. The aim of root canal treatment is to prevent your tooth from being taken out by removing the damaged pulp and treating the infection. If an infection isn’t treated, it can spread further and cause an abscess, which is a collection of pus. This can be painful and tender and can cause swelling around your tooth and jaw. Sometimes your tooth may look darker in colour than your other teeth, which means that the nerve inside your tooth is dead or dying. Without treatment, the infection may spread further into your jawbone and you may need to have your tooth taken out. 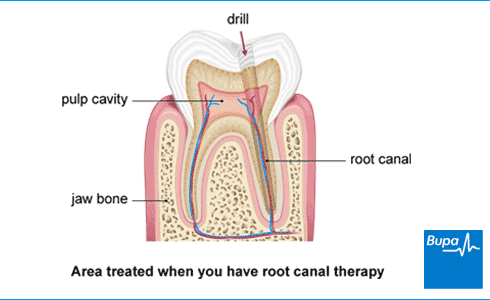 Root canal treatment is done by a dentist. But if your tooth is difficult to treat, your dentist may refer you to an endodontist. This is a dentist who specialises in root canal treatment. Your dentist will examine you and ask about your symptoms, including any pain you’re having. They may also ask you about your medical history and any previous treatment you’ve had on your teeth. Your dentist will take an X-ray of your tooth. This can help to show which tooth is causing your pain and needs treatment, and how far any infection has spread. These examinations are necessary for your dentist to make sure that the tooth is not too badly damaged for root canal treatment and can be fixed. Although some root canal treatments can be completed within one appointment, most are done over two or more sessions with your dentist. This is because they require skilled dentistry and it can be time-consuming. Root canal treatment is usually done under local anaesthetic. This completely blocks pain from your tooth and jaw area, and you will stay awake during the procedure. If you’re worried about having a local anaesthetic, talk to your dentist. Your dentist will describe what will happen before any treatment takes place. If you’re unsure about anything, ask. No question is too small. It’s important that you feel fully informed so you feel happy to give your consent for the procedure to go ahead. You may be asked to do this by signing a consent form, but this isn’t always the case. Some people find going to the dentist makes them feel nervous and fearful and this can stop people getting the treatment they need. Read our information about dental anxiety, and how you can get support and help to manage it. Sometimes, damaged teeth can’t be repaired with root canal treatment. This is usually if your tooth is badly damaged or if you have severe gum disease which prevents your tooth from healing or being well supported after treatment. If this happens, your dentist may suggest you have the tooth removed (extracted). Your dentist will give you a local anaesthetic injection before starting your treatment. This is to make sure you have no pain during the procedure. Once the area is numb, your dentist will place a thin rubber sheet inside your mouth. This is called a dental dam and covers everything except the tooth being worked on. It helps to keep the area around the tooth clean and stop the spread of any infection. Using a drill, your dentist will make a hole in the top of your tooth and remove the pulp. They will clean out the empty hole using small instruments and a liquid to irrigate and disinfect the inside of the tooth. The instruments help to make the canals a more regular shape to enable the tooth to be filled and cleaned more precisely. The irrigating liquid makes sure that all infected material is flushed out. Once the tooth is clean, your dentist will fill and seal it. Unless the dentist is sure that all infection has been removed, they will put in a temporary filling. You then have a second appointment to have the tooth permanently filled. If your tooth is badly worn or is at risk of further damage, your dentist may suggest having a crown fitted. This is an artificial cap that fits over your tooth. You’re more likely to need a crown if you’re having one of your back teeth treated, because these are used for chewing. Having root canal treatment can be uncomfortable because you have to sit still with your mouth open for longer than you’re used to. Your dentist will make you as comfortable as possible before the procedure starts. After a local anaesthetic, it may take several hours before the feeling comes back into your jaw and face. Take special care not to bump or knock the area. You may need pain relief to help with any discomfort after the anaesthetic wears off and for the next couple of days. You can take over-the-counter painkillers such as paracetamol or ibuprofen. Always read the patient information leaflet that comes with your medicine and if you have any questions, ask your pharmacist for advice. When you next need to see your dentist will depend on the reasons for your treatment and how the procedure went. Your dentist may ask you to have further X-rays and check-ups to make sure that the tooth is secure and you’re healing well. Some people need to have further root canal treatment if the tooth cracks or more decay develops. After your treatment, it's important to take care of your repaired tooth. These tips will help to keep your mouth, teeth and gums healthy. Rinse your mouth with a mouthwash, if your dentist recommends it. Try to limit sugary foods and drinks and only have them at mealtimes. See your dentist regularly for check-ups. Side-effects are the unwanted but mostly temporary effects that you may have after the procedure. You may have some slight tenderness around the tooth that has been treated, but usually this lasts for only a short time. If you have severe pain or any pain or discomfort that gets worse, see your dentist. The area around your tooth may also be swollen and bruised. This should get better within two weeks of your treatment. Complications are when problems occur during or after treatment. All medical and dental procedures come with some risk. But how these risks apply to you will be different from how they apply to others. Be sure to ask for more information if you have any concerns. Sometimes, root canal treatment doesn’t work and you may be advised to have more treatment. This is called re-treatment. Sometimes, symptoms can return years after you’ve had root canal treatment and your dentist may suggest re-treatment then. How long will the restored tooth last? How long will the restored tooth last? After root canal treatment, the restored tooth may last as long as your other teeth. Your dentist won’t be able to guarantee your root canal treatment will last forever. Some research shows that almost nine out of 10 root canal-treated teeth are still intact after eight to 10 years. There are lots of things that can affect how long a restored tooth lasts, including the type of tooth you’ve had treatment on. The best thing you can do is practise good oral hygiene to care for your teeth and gums, and see your dentist regularly. Will I have to pay for root canal treatment? Will I have to pay for root canal treatment? You will have to pay for root canal treatment, unless you’re eligible for free NHS treatment. Your dentist will give you a written estimate of the costs involved before you start your treatment. If you’re treated by an NHS dentist, you will be able to get your treatment free of charge, or at a reduced cost. Whether or not your treatment is free will depend on your circumstances. For example, if you’re under 18, pregnant or receiving certain benefits, you’re entitled to free treatment. If you’re not eligible for free treatment, root canal treatment will cost around £60 on the NHS. If you have your dental treatment privately, you will need to pay all of your treatment costs. The costs of private root canal treatment vary from dentist to dentist. How much your treatment costs will also depend on how severe the problem is and the type of tooth being treated. Any number of things can cause a dental injury. This article explains what to do if you have a dental injury, what the treatments are, and how to care for your healing mouth. Teeth whitening uses bleaching methods to lighten the colour of your natural teeth. You may want to whiten your teeth if they’ve lost their whiteness overtime, or because of smoking or stains from food and drink. Gum disease is a common condition that affects the tissues around your teeth. It causes swelling and redness of your gums, and sometimes pain. If your tooth is damaged or decayed and can’t be repaired, or is very difficult to repair, you may decide to have it removed (extracted).